Dr. Veronica Walters led a panel discussion with successful non-profit leaders at the March luncheon for the Tampa Bay Charity Coalition. 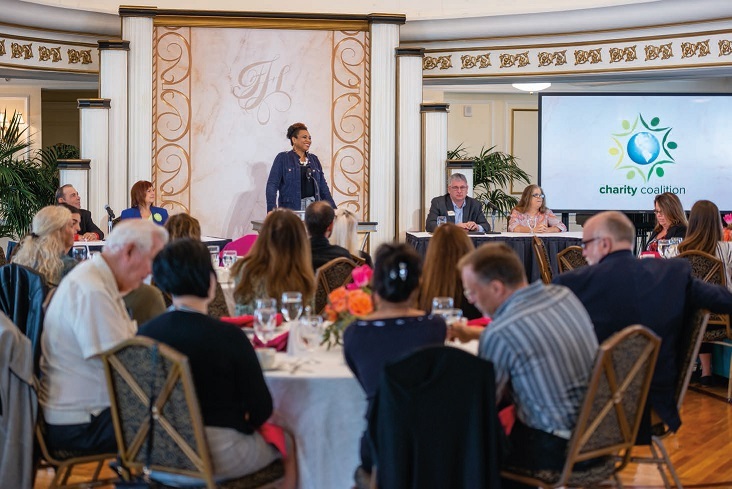 CLEARWATER, FLORIDA, US, March 21, 2019 /EINPresswire.com/ -- Clearwater, FL – On Wednesday, March 20, more than 50 nonprofit representatives gathered in the Crystal Ballroom of the historic Fort Harrison for the Tampa Bay Charity Coalition’s bi-monthly Networking Luncheon. Sponsored by the Church of Scientology Flag Service Organization, the luncheon was highlighted by a panel discussion with four leaders in the non-profit arena. The panelists represented a broad spectrum of charity types – from Karena Morrison and her Benevolution Foundation; to Pam and Joel Anderson and the Clearwater Community Volunteers; to Neil Brickfield and the Pinellas County Sheriff’s Police Athletic League. The panel was moderated by a thirty-year veteran in the field of education Dr. Veronica Walters. Questions from the audience included; ‘How do I get my group more well-known?’ ‘How do I fundraise?’ and ‘How do you stay motivated?’ This provoked a very lively discussion with some inspirational answers. Guests were encouraged to go out and talk to people, face to face, in order to grow their network of potential donors and volunteers. Following the presentation, guests networked and got to know each other better. The next Charity Coalition function will be the on the 15th of May in the Fort Harrison Crystal Ballroom. To attend or for more information about the Charity Coalition please contact Dylan Pires at (727) 467-6860 or dylanpires@churchofscientology.net.